Rocking the Boat’s acclaimed Rocking Manhattan fundraising event was held for the seventh straight year on Saturday, October 17. 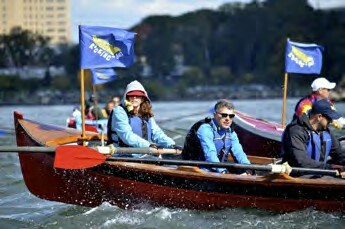 More than 100 people rowed 29 miles around Manhattan Island over nine and a half hours, raising $269,000 to support the Bronx, NY-based non-profit organization’s innovative youth development programs. Rocking the Boat students work together to build wooden boats, learn to row and sail, and restore local urban waterways revitalizing their Hunts Point community – recently deemed the least promising place to grow up by the Citizens’ Committee for Children of New York – while creating better lives for themselves. All Rocking the Boat students graduate from high school, compared to 33% of their local peers, and most go on to enroll in college or trade school. The steadfast rowers traveled in ten 27-foot, four-oared Whitehall gigs counterclockwise from Pier 25 in TriBeCa around the Battery, north up the East River and into the Harlem River, before traveling south down the Hudson to Pier 25. To ensure a fun and safe ride, there was one chase boat on the water for every two rowboats. The fleet followed the tides the whole way and dodged large commercial vessels including the Staten Island Ferry, the Circle Line, and a couple of harbor cruise boats. Fourteen Rocking the Boat program graduates were rigorously trained as coxswains to drive the boats. An additional 20 individuals participated as spectators aboard Adirondack, an 80-foot wooden schooner generously donated for the afternoon by Classic Harbor Line. Following the row, a dinner and awards ceremony honoring the top fundraisers was held aboard Lilac, a former lighthouse tender, now a floating museum. Visit rockingtheboat.org for more information.